Panic attacks are something I have seen more commonly in young people than in other age groups for some reason, in my practice. The attacks have often come on in their late teenage years/early 20’s and have been diagnosed as such by their doctor. The symptoms of the attack can include shortness of breath, palpitations, dizziness, an out of body feeling and fear. Sufferers can feel they have become prisoners of their condition even though it may not happen very often. 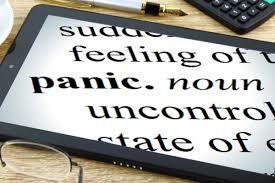 Sometimes it is the fear that another panic attack may occur that is the most frightening. It can be very limiting in a person’s life. It can affect a person’s ability to partake freely in their work or college life, to have a social life and the ability to make plans. Anyone suffering with these symptoms who is undiagnosed, must first seek medical advice to rule out any other conditions. Knowing that you are suffering from panic rather than suffering with a heart condition can be reassuring. Using Homeopathy when suffering from chronic anxiety such as in panic attacks is not suitable for home prescribing and the case needs to be taken in depth in order to effective.